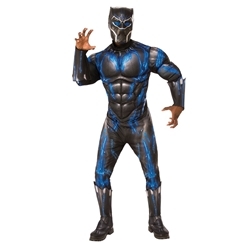 The Black Panther Battle Suit Adult Costume includes Padded Jumpsuit with Boot Tops, and Mask. This costume is available in Men’s Size Standard or X-Large. Leap into action as the Black Panther! Wear this iconic battle suit and you will channel the power of the hidden nation Wakanda. With Vibranium in hand and the Panther Ancestry in Spirit, take on any foe this Halloween!